Kahu Kāhealani Kawaiolamanaloa Satchitananda is sanctioned by the State of Hawaii to conduct weddings, civil union ceremonies and baby blessing services. As Kahu, she also does Native Hawaiian Healings such as Ho'omanamana Initiations Blessings, Home/business Blessings, Ho'oponopono Counseling/Coaching (Skype/Online) and La'au Lapa'au Hawaiian Healing Retreats and Sacred Ceremonial Tours. Pure Aloha...........Wisdom Wealth Love and Liberation! It is the medicine of the future! and Distance Healing Protocols for Restoring Health and Wholeness. Kahu Kahealani Kawaiolamanaloa Satchitananda, Director and Cross-Cultural Ho'oponopono Practitioner is humbly grateful for the honor of having been given the rare and special permission to offer the Crystal Baths here at Hale Malamalama Ola Pono by John of God, a renown international healer of Brazil who has helped thousands of people. He was recently featured November 2010 on Oprah. Update: Oprah, herself is right now at the Casa with John of God in Brazil. The Healing of Humanity and the Planet Is Happening. Ho'oulu Ola I Ke Aloha...Nurturing Life With Love...Life Is Sacred!!! Cherish It!!! HEALING happens in MIND, BODY & SPIRIT. I do not cure anybody. God heals, and in his infinite goodness permits the Entities to heal and console my brothers. 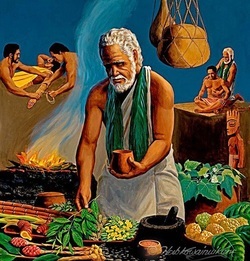 I am merely an instrument in God's divine hands"
Disclaimer: I, Kahu Kāhealani Satchitananda, am not a medical doctor and do not practice medicine. I don't diagnose, heal, cure or treat disease. I recommend people continue to see their medical doctors and follow their advice. My work is a complement to conventional medicine. This spiritual energy work is not a substitute for conventional medical treatment of any kind, physical or psychological. For such issues you should seek the proper licensed physician or health care professional. This energy work may help the chakras come into energetic balance. Spiritual energetic work theory believes when one's energy field is in balance, the body's latent healing ability can heal itself. I make no promises or guarantees about the results of this work.